One of a kind hanging pendant light fixture featuring three vintage reproduction industrial cage lights. Three cage lights styled after trouble lights used in the 20s-40s, are made of brass wire, and are hinged to open or close as desired, depending on what look you prefer, and for bulb removal. They fit around new black sockets and are wired with vintage style black cloth covered twisted wire. They use two different styles of reproduction Edison bulbs, one with “squirrel cage” filaments and two round bulbs with spiral filaments. All three lights are suspended from a vintage leaf spring removed from my 1954 GMC pickup and was left with its original patina. Included with the light are three bulbs and canopy for mounting to and existing box in the ceiling. Size: Approx 30″ long. Wire from leaf spring to ceiling can be cut to desired length, but comes with approx. 24″ of wire. Available in our Etsy shop, here. 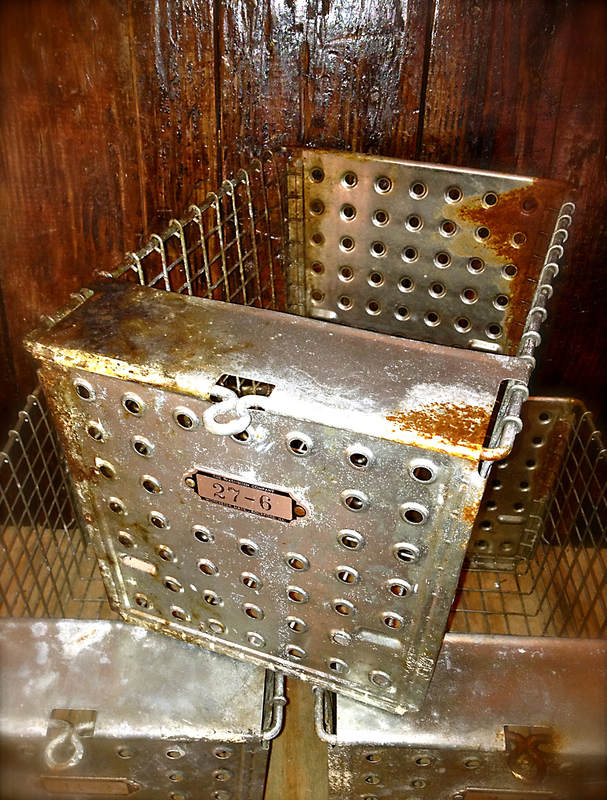 Vintage metal gym locker baskets from the 60s. These are steel in original finish with nice patina. All are in very good condition with light surface rust and patina in various stages. These have been sprayed with an acrylic clear coat finish to preserve the finish. Side are steel wire and front and back panels have holes and a “cheese grater” like appearance. All are fully intact and very solid. Also have a loop on the front and all have stamped metal numbered labels on the front, and marking from the manufacturer: The Washburn Company – Worcester, MASS / Rockford, ILL. 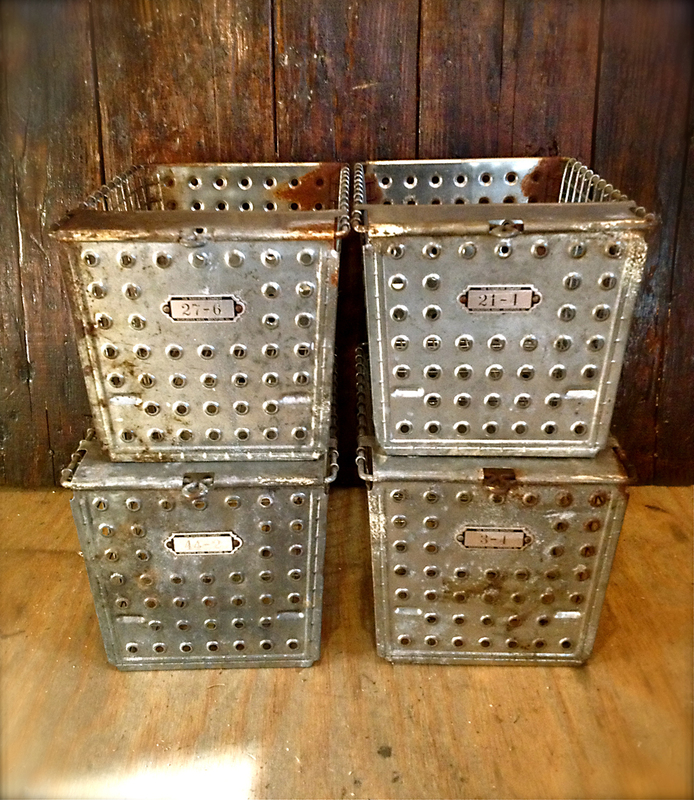 These baskets are nice accent pieces and are great for storage around the home. The bottom dimensions are 12″ deep x 7″ wide. The top dimensions are 13″ deep x 8.75″ wide. There are 4 of these currently available, all in equal condition. Email us for shipping price on multiples. Available in our Etsy shop. 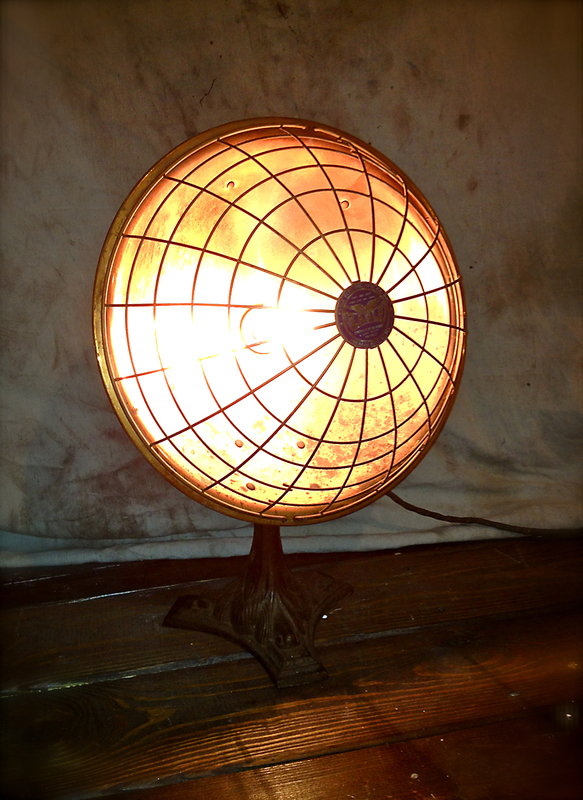 This is an Eagle brand 1920’s vintage table lamp / radiant heater. 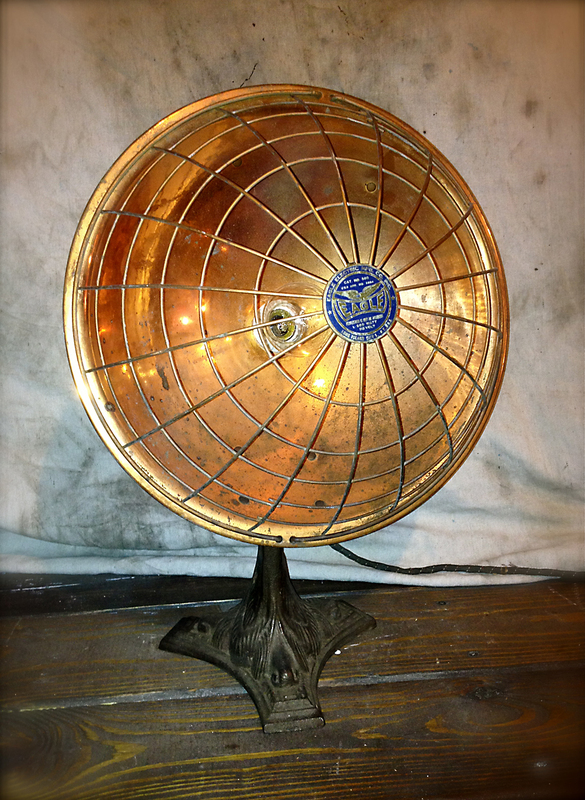 These were originally used as small space heaters during the early 20th century. The original coil heating element is included and screws in to the standard socket to also function as a heater. 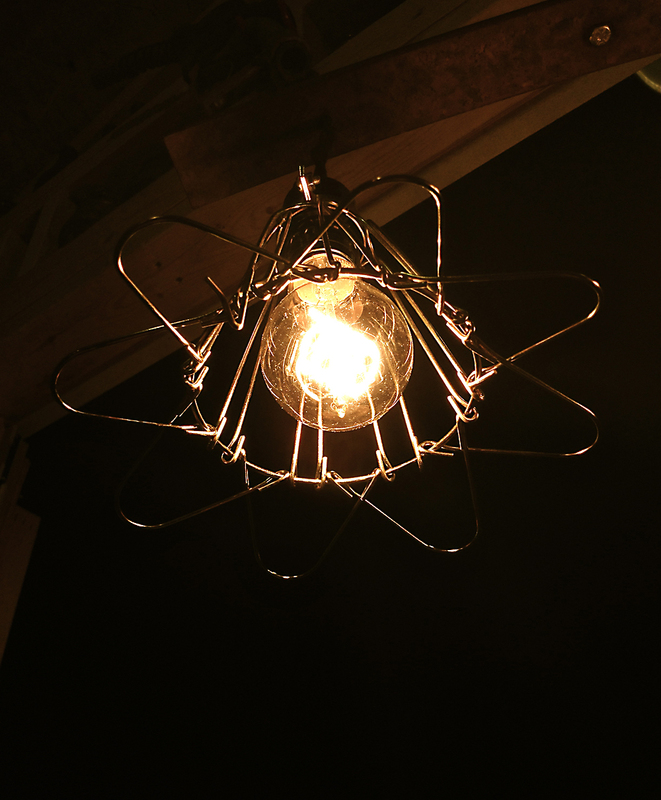 We removed the heating element and replaced it with a vintage Edison style filament bulb for a warm, dramatic effect. Any standard based bulb will fit, however. The lamp’s base is made of heavy cast iron and the shade and cage are both made of copper. The light was cleaned and the copper lightly polished but still retains all of its original patina. Original cloth covered wire was kept, but the plug was replaced with a vintage reproduction. Very cool and unique piece of history and makes a great addition to your office, living room, etc. Vintage industrial factory cart. All original. 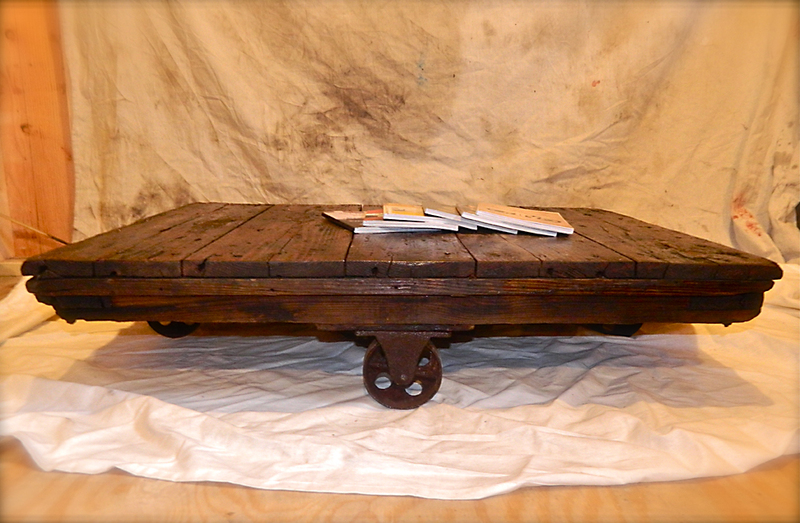 Very heavy, solid wood with original cast iron wheels. These are becoming very popular for use as coffee tables and statement pieces. They’re also becoming very hard to find. Cart was left with original patina and not refinished. It has perfect patina, which refinishing would ruin. It was thoroughly cleaned and polished with a clear wax to preserve the finish. Available for sale locally (Portsmouth, VA) or in our Etsy shop. Click here for the full listing. Buyers outside the lower 48 states, please contact us for shipping quote before making payment. Note, shipping cost is an estimate. Please request quote before making payment, varies greatly depending on location. One of a kind industrial style, machine age wall sconce / key rack with storage bin. This wall mounted lamp was made from all reclaimed materials with the exception of a new socket and new vintage style cloth covered black twisted wire. Backing is a piece of 1″ thick x 9″ wide reclaimed wood. Looks to be a piece of an old gate. Top portion has remains of a heavy steel hinge with nice patina, attached to the board with heavy lag bolts. Industrial lamp cage is thick cast iron with some numbers embossed on the front and was found at a garage sale locally. 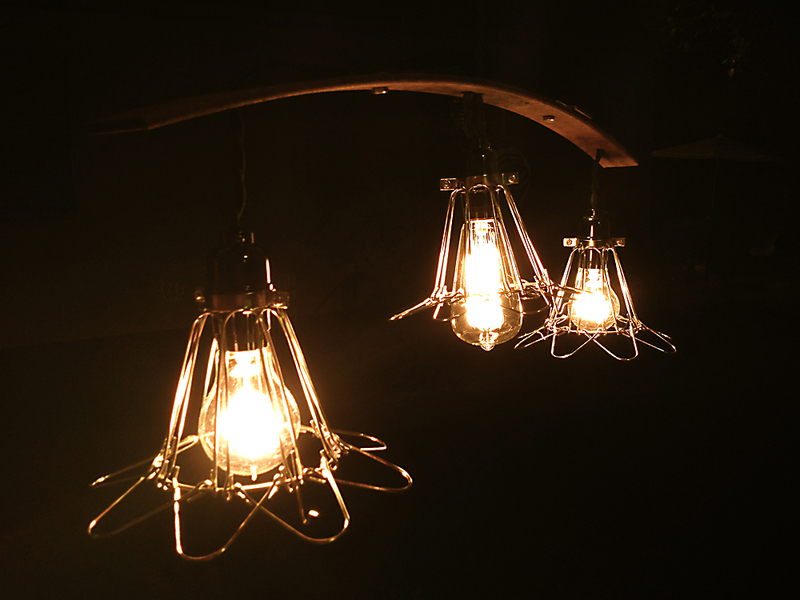 Unsure of what it’s original use was, but worked great as a surround for the vintage reproduction filament bulb. Vintage hooks are mounted below the lamp and a small tin storage bin finishes off the piece, mounted to the bottom. This will make a nice piece for your hallway, living room, den or kitchen. Nice conversation piece and great way to store keys, mail, etc. Comes with approx 6′ of vintage style cloth covered black twisted wire, with an inline switch and plugs directly into any wall outlet. Can also be hardwired and switched if desired. Rustic style sconce, hanging wall lamp. Made from an upcycled, galvanized steel feed scoop. The scoop features round holes throughout the scoop which acts as the canopy. Barn find scoop with nice patina has been fitted with a keyed (switched) lamp socket which accepts a standard base light bulb. Wired with approximately 8′ of twisted black cloth covered wire and plugs into the wall. Mounts easily to any wall with a simple nail, hook or screw. Lamp comes with vintage wound filament bulb. Here’s a new table I recently finished. 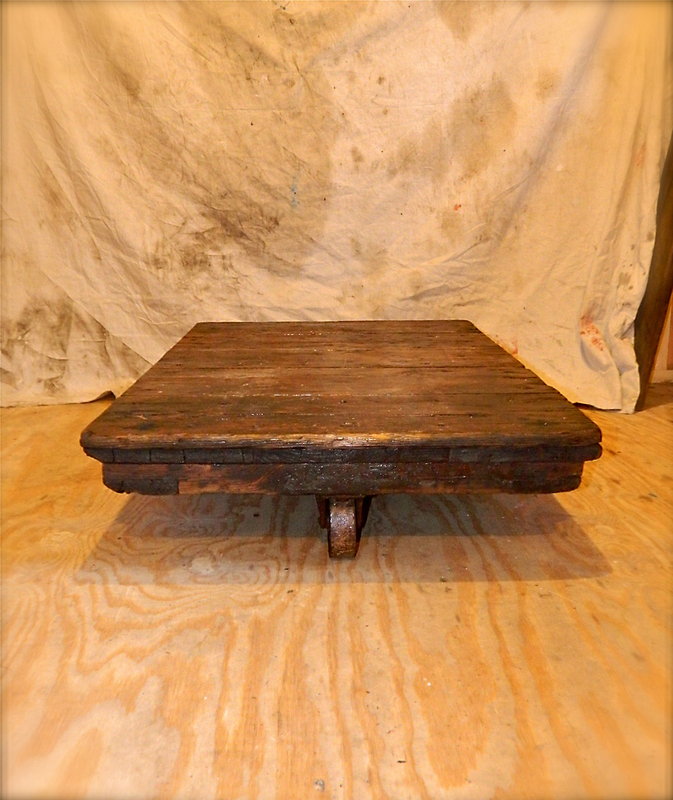 One of a kind primitive, rustic table. Made from reclaimed wood which has been lightly sanded, stained and hand waxed. Table legs are repurposed cast iron sewing machine legs with small wheels which make it easy to move around. Patina’d finish, with elaborate design and “Standard” logo built into the casting. Lower shelf was made using the same material. Wood is salvaged, solid and 2 inches thick. This table could serve a variety of purposes. It’s the perfect size for a small kitchen island, bistro table, computer desk, foyer table, or television stand. Table ships unassembled, but it’s very simple to put together. 4 carriage bolts re-install with simple tools and shelf attaches with 4 phillips head screws. Assembles in minutes.